Our 2nd generation RLT Illuminator LED spotlight has been revised and improved after being recommended in Sail Magazine, Panbo.com, National Fisherman Magazine, Boating Magazine, Steve Dashew's SetSail Tech Blog, and the French sailing magazine Voiles & Voiliers. This waterproof handheld LED searchlight uses patented light recycling technology to achieve an ANSI-FL1 rated beam distance of up to 700 meters. The collimated 4-degree spot beam is made specifically to be used as a handheld searchlight for finding and illuminating buoys, channel markers, crab pots, and hazards at extreme distances at night. This flashlight is also perfect for a search-and-rescue scenarios, and has an optional high-output strobe function to attract attention. Portable halogen and HID marine type spotlights are power-hogs and require deployment from the bow because they reflect light back into the cockpit. The handheld RLT beam is tightly collimated, with no spillover light, so it is easily and quickly deployed from the cockpit without reflecting back and ruining your night-vision. It uses Wavien's remarkable patented invention called Recycled Light Technology (RLT), which is a simple, cost-effective way to dramatically increase the brightness and efficiency of standard LEDs. Wavien's technology is also used to produce a powerful handheld non-lethal LED light weapon called StunRay™, which creates a light so bright that it temporarily blinds, stuns, and disorients an attacker. Our light uses the passive RLT component technology to increase the usable light output of its Cree LED by over 2 times. It does so by collecting the high-angle spill-over light that would normally be wasted, and redirects this light back onto the LED emitter surface. This re-excites the LED phosphors, which generates more useable light, further collimating it, and directing it down range. The usable LED light output is significantly boosted by the RLT, with no additional LED input power required, and no change in LED lifetime. 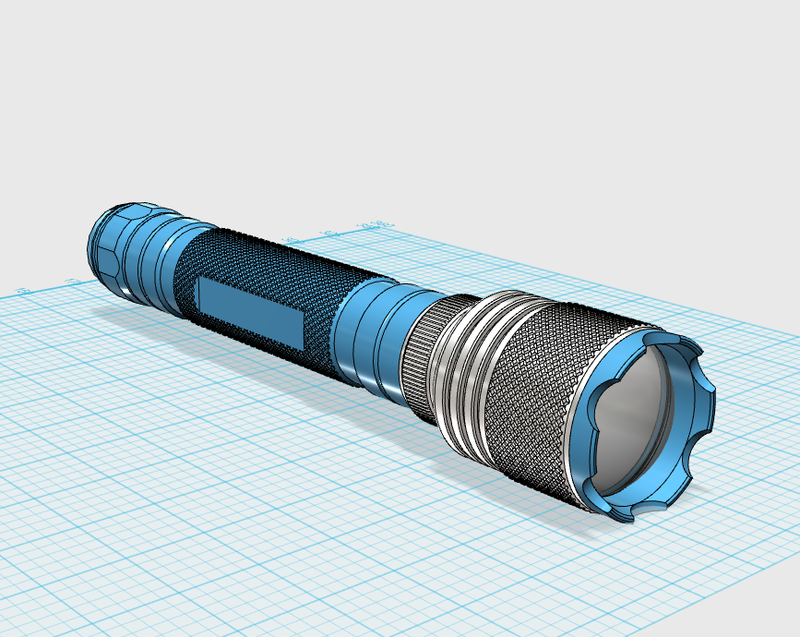 No other flashlight can do this. This candela-compounding is only possible with RLT. Notice that nowhere in this description, or in the specs, will you find any outrageous lumen claims. That is because the long-range illuminator uses its efficiency to gain beam distance, not battery draining LED power. In fact, the best part of the technology is that the power consumption and lumen output of this lamp do not need to be unnecessarily high, because the lumen-density (Candela) is off the charts. So, please do not use our lumen figures to compare this lamp's output or its long range illumination capabilities. Use the ANSI FL1 standard, which was developed for the sole purpose of comparing flashlight beams against an international standard. As a point of reference, the Streamlight Stinger HPL, which is a very high-end, high-lumen long range LED flashlight, with a specialized long-range reflector and a 1.25 hour battery life, has an efficiency of only 64 Candela/Lumen. By contrast, the Marinebeam Long-Range Illuminator has an efficiency of more than 400 Candela/Lumen, so it can make two-and-a-half times more brightness (120,000 vs 48,000 Candela) with much less power, and has a 12 hour battery life. The typical LED flashlight has about 50° of wasted spill over light, while the Marinebeam Illuminator flashlight has no spill-over light whatsoever. By redirecting and recycling all of this normally wasted light energy, we can throw all of the beam energy down range. The Illuminator not only benefits from a lack of wasted spill-over light, but also from its ultra narrow 4° beam angle, which produces a super-defined spot, which at 300+ yards is only about 60 feet in diameter. It is a true spot light. For a further detailed explanation of how this light beats all other LED flashlights, read our How RLT Works document, or watch the detailed 10-minute video below. The best analogy to understand how we can make more brightness with less power is a laser beam. Handheld lasers have incredible distance capabilities, even when using very, very low power (tenths of a Watt). This is also true of Marinebeam's Illuminator RLT. We can get an ANSI/FL1 beam distance of over 690 Meters and a very compact spot size, with only 600 lumens. The spot is so precise and well defined that when it is shined upon a wall, you will actually see an exact image of the LED chip projected. The perimeter of the spot is a perfectly crisp line, and all of the light inside the spot is high energy light. There are no halos, rings, or dark spots like you would find on a typical searchlight. This image, and its intensity, are not just the result of a collimating aspheric lens, but rather a result of the the RLT optic recycling and boosting the entire amount of spillover light and presenting it to the lens from the exact focal point. The ANSI/NEMA FL1 Standard defines the "maximum beam distance" as the distance (in meters) at which the light will land 0.25 lux of illuminance. So, that is the equivalent light, at 690 meters, of a full moon in an open field on a clear night. It is calculated by taking the square root of Peak Candela/0.25. FL1 beam distance is not to be confused with visibility, which is the distance at which the beam can be seen by the human eye, given the average atmospheric transmissivity of light. The visibility of this lamp using the US Coast Guard formula for visibility at sea is more than 24 miles, which makes it great for signaling aircraft, etc. We have all seen long-range beams, but imagine standing on the tee box of a long Par 5 at your local golf course, on the darkest night, and being able to illuminate the green and the pin with just this handheld LED light! The light hitting the pin 500+ yards away would also be enough for people on the green to take a nice clear picture or video of each other with a cell phone camera. Now imagine that you can keep it illuminated for 8 to 12 hours with the standard off-the-shelf D cell batteries. This is all possible with the Illuminator RLT. The Marinebeam Ultra Long Range LED Illuminator RLT is tough and impact-resistant, with a rugged aluminum casing, which resists rust and corrosion. It also features a long lasting Cree XML2 LED made by Cree USA, a world leader in LED technology. If you have any doubts about the performance of this light, please also read the unsolicited customer reviews below, or take us up on our 100% satisfaction guarantee. For those techies that really want to understand flashlight "throughput", and why Recycled Light Technology makes any LED brighter, the 10 minute video below goes into the throughput problems of traditional flashlights. It explains how the patented RLT technology works inside our flashlight to solve the throughput problem, and how it allows the maximum amount of light from the minimum amount of lumens. We don't know about you, but when we reach for a flashlight on board, we want it to work. Rechargeables are great, but can take a long time to charge, typically have less capacity, and are more expensive to keep multiple spares around. Our experience is that rechargeables don't seem to have the shelf-life we've come to expect from beefy and readily available D-cells. Nothing is worse than grabbing a dead flashlight and then having to wait 8 hours for a recharge. Li-Ion batteries are also now difficult and expensive to ship, almost exclusively of questionable Chinese origin, and can be very dangerous to charge aboard you boat in hot climes. Besides, because our lamp is so efficient, a good set of D-Cells should last you the whole season. Where is the Illuminator designed and manufactured? The Illu minator is not only designed in the USA, but is also hand-assembled right here in South Carolina using components produced here in our shop, as well as sourced worldwide. The LED emitters employ the latest technology from Cree USA, just up the road in North Carolina. The RLT technology is an American invention with US and worldwide patent protection (Patent #7976204). Marinebeam licenses the RLT technology from Meadowstar Enterprises of East Meadow, NY. Dr. Kenneth Li, and Dr. Seiji Inatsugu, both American scientists, originally developed and patented the RLT technology. Dr. Li holds a BSEE from California Institute of Technology and an MSEE and PhD in quantum electronics from Northwestern University and University of California, Berkeley respectively. He also earned an EMBA at the University of California, Los Angeles. Dr. Li has held various senior positions in TRW Technology Research Center, PCO, Inc., and Hewlett Packard, where he was responsible for the development and manufacturing of lasers, LEDs, and photodetectors for fiber optic communication. Dr. Inatsugu holds a Ph.D in Physics from the University of Hawaii, and is a specialist in optics and lasers. He had a 26 year career in R&D at Laser Media, Inc. the world's largest laser effects company. We 100% guarantee that this is the best battery powered handheld LED spotlight available for marine applications, or we will buy it back - no questions asked. Great light. I use it on the boat at night to spot crab traps and the shoreline in the inter coastal waterways. Would recommend. Just received my light. It is BRIGHT. And the beam is very tight. Haven't had time to evaluate battery life but I expect that to be adequate. My only, fairly minor criticism, there is a little bit of spillover in the form of bluish ring or halo about 15 degrees out around the main beam. The halo isn't too bright but is noticeable and I expect it will add some degree of illumination to the bow or sails when using the light to spot channel markers or hazards from the cockpit. However, this spillover is much less than any other light I've tested so far. Great light. Shines very far and has a good concentrated beam.